This year, I participated in SOFOBOMO 2011 and successfully made (photographed, edited, processed and created ) a pdf ebook within 31 days. The book is called \”After Sunset” and is available as a free download here:After Sunset PDF Ebook. For my desktop publishing software, I found a bunch : Adobe InDesign, Quark Xpress, Scribusâ€¦etc. I decided to use Scribus – for the reason that it is a open source software and is available for free. I highly recommend spending the time to se this excellent video tutorial. The Part II of mat\’s tutorial is another hour, but it is another hour I found totally worth the investment. This is the only resource I did not use when making my pdf – I cam ecaross these tutorials when writing this post. It seemed too goo a resource not to list. As I am writing this, I am now in my second week of SoFoBoMo 2011. For the first week, my game plan called for the collection of images. And collect images I did. I pulled in about 7.30PM – sunset was supposed be at 8.30PM. It is very disconcerting, and exhilarating d to pull in and park when everyone else is leaving the beach. It\’s almost like the sunset is just for you. So, I pull in and park on the side of the road. For the first time I take a look at what the signs say: Parking allowed from 8.00AM to sunset only. So what is a photographer who wants to photograph after sunset do? I decided to park a little away where there was no board. And try to shoot while keeping an eye out on my car. Luckily this beach allows a view of the parked car from all over. Since sunset was 8.30PM, I had a bit of time to wander around. I was pretty uninspired until I went to the far north of the beach where Scott\’s creek was joining the ocean. I took a deep breath, got out of my hiking shoes and crossed the creek – cold cold water. ON the other side of this creek, there were some rocky shelves, undisturbed sand and a whole lot of inspiration. Suffice to say, my first day of shooting was very successful indeed. After that, during the week, I got out of work and drove to San Gregorio Beach – just south of Half Moon Bay. This excursion was the least productive – I arrived there at 8.15 – just before sunset. And I didn\’t make any photos I liked from this excursion. Next stop, again on a weekday night was the awesome Pescadero State Beach. This beach was so awesome, that I had to go back and shoot there again the next Sunday (officially Week 2 of SoFoBoMo). So how did I do overall on Week 1? Pretty good. I got 23 decent images from one week of shooting – three visits to the beaches. The good ones were picked and processed as well. Including this Sunday\’s excursion, I now have 35 photos selected for the book. They have all been processed and kind of sequenced. Some aspects of teh project changed during this week. I had originally wanted to shoot using the digital Holga and Peleng lens – instead I am using my trusty trio of the 50mm f1.8, the 17-40mm L and the 10-22mm EF-S lenses. One other change – I had initially thought of shooting those beaches where a creek flows into the ocean at sunset or sunrise. Now I just shoot in beaches around sunset. This is what other SoFoBoMo-ers mentioned – be open to the nature of the project changing. I also seem to be shooting mostly at sunset. So the \”sunrise” might disappear from the options soon. What next? Though I have 35 photos, I know that some of them can be better. 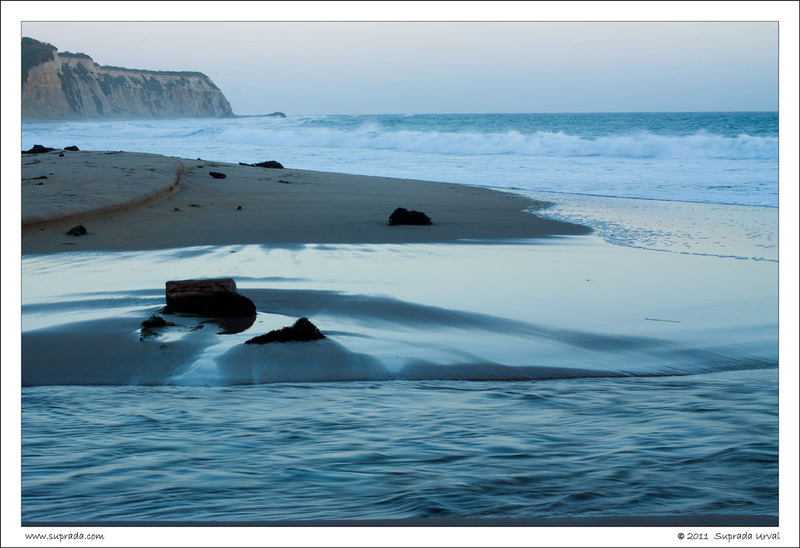 So I plan to go out and shoot one more time – this time to maybe Four Mile Beach or Davenport beach or Waddell beachâ€¦ Also it is time to dig into desktop publishing software and the challenges of PDF creation. More about that in my next post. I will leave you with a photo I am most pleased with from my excursion to Scott\’s Creek beach. It might even be the cover image of the book! What do I like about it? Everything. The reflections, the light and shadow, the palette, the awesome opportunity to actually spot the fancy light work while I was shootingâ€¦ everything! Scott\’s Creek, by Suprada on Flickr. 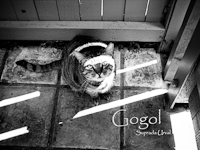 These days I am very excited about participating in SoFoBoMo 2011 – \”The worst photo competition in the world\”. For those of you who don\’t know about SoFoBoMo – it stands for Solo Photo Book Month. What are the rules? Make a photography ebook/PDF with a minimum of 35 photos . From the shooting to layout to finishing and posting -it needs to be completed within 31 days. Participants can begin any time between July 1 and aug #1 – but once they start they have 31 days. Sounds nuts? Sounds challenging? Sounds easy? You should try it. It\’s not too late to give it a go. You can go here to register until July 30 2011. So why am I taking part in this? After being in a photo-coma for the first half of this year, this is an awesome way to regain my photo-conscious. I need the discipline of dedicated photography, the challenge of trying to photograph with a theme / idea in mind and ending up with a related body of photos – a project! I like the challenge of creating a book – of grappling with layout, format – of learning about editing and designing and typography. Most of all, it is very nicely self contained – there is a beginning and an end. If I don\’t make a book in 31 days – the time-period is over – and my tendency to carry on forever can\’t play here. My SoFoBoMo month started last Saturday – July 7 – when I started taking some photos. I signed up for SoFoBoMo 2011 back in May. Since then, I have been doing some research / prep work. I have been reading the resources section of the SoFoBoMo website, tips from other participants. I have also been looking into which desktop publishing software to use, studying book design, basic typography, layout , editing etc – what fun! All the while eagerly waiting for July to begin. Week 4 – Publishing ebook and Done. Week 4 – Last week for polishing the book. Before I started on my SoFoBoMo month, I decided on what I would shoot this time around as a part of my preparation (allowed by the rules). I decided on the working title of my book \”Confluences\”, the tag line being \”when day meets night, when water meets land\”. My idea was to shoot the spectacular beaches of Santa Cruz and San Mateo counties at twilight – either around sunset or sunrise. I wanted to use the digital Holga lens from Holgsmods.com and a Peleng 8mm fisheye lens for this. And use Scribus – a free desktop publishing software (alternative to Adobe InDesign) to create the book. And accompany photos with text and maybe some poetry. The photograph below inspired me to choose my theme for this project. More on what\’s happening since July 7 on my next post. Blue Hour, by Suprada on Flickr. 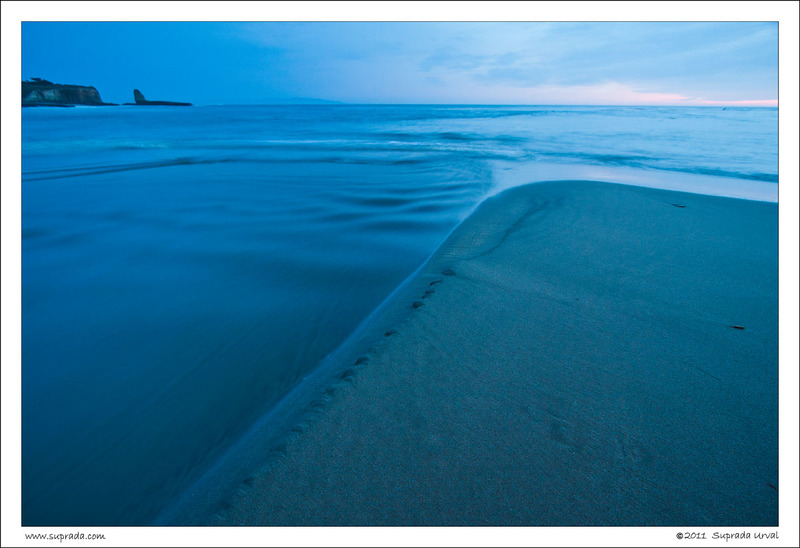 Blue Hour, 4 Mile Beach, Wilder Ranch, Santa Cruz County. Now, it is time to start looking at other participants and figure out this whole book design thing.